The use of implantable biomaterials in cardiovascular system is growing, in part because of the improvement of biotechnology. 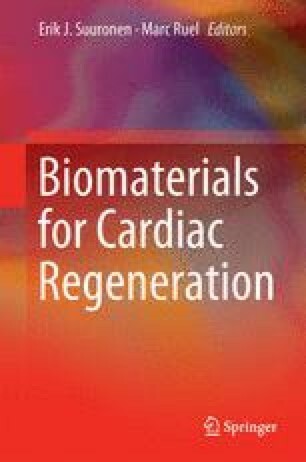 These biomaterials provide opportunities for effective treatment of cardiovascular diseases with minimal associated morbidities. However, in doing so, there are concerns regarding the immune responses to these implants, and in particular, long-term reactions are crucial. The relatively recent advent of tissue engineered implants promises to revolutionize patient specific devices, yet it comes with the added complexity of understanding host–implant compatibility. In this chapter, we discuss the current comprehension related to immune reactions to implants, both cell-based and acellular. Tissue and organ rejection in the cardiovascular setting are discussed together with the immunologic considerations for grafts, patches, and heart valves. We explore the use of stem cells in cardiovascular bioprostheses as well as their associated advantages and potential risks. Lastly, potential future directions of tissue-engineered cardiac bioprostheses are discussed.